Personalized Car Notepads Custom Printed in Bulk. Promotional, Inexpensive. Bulk car visor notepads with mini ballpoint pen and sticky notes, custom imprinted with your logo or message. 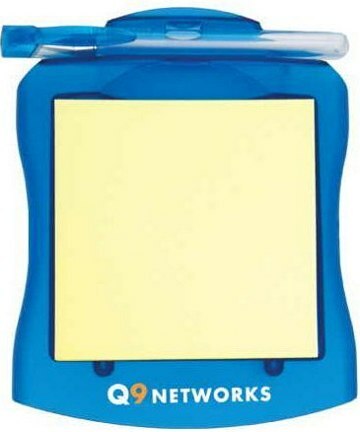 Clip this notepad onto your car visor and enjoy the convenience of having a pen and paper at your fingertips! Comes with a sample pack of sticky notes (standard size for refills) and a mini ballpoint pen. Novelty: PATENT D499,373. We also supply wholesale blank (not imprinted) car notepads for $1.29 each. 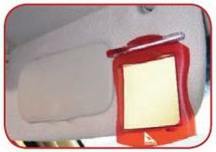 Budget Prices in the USA and Canada for wholesale car visor notepads. American clients pay no taxes, Canadian clients don't pay PST. We will send you a proof for your approval before production. Prices include a 1 color, 1 location screen imprint. Setup Charge is $40.00 per color. You may order any in-between quantity; assortment of colors is allowed. If you require additional colors or imprint locations, then you have to add $0.25 per color, per imprint location, per unit, plus an additional Setup Charge of $40.00 per color, per imprint location. Additional imprint colors: add $0.24 per color, per item. Colors: Translucent Red, Blue, Green or Solid Black. Production Time: 5 days; Rush 3-days production is available: contact us.